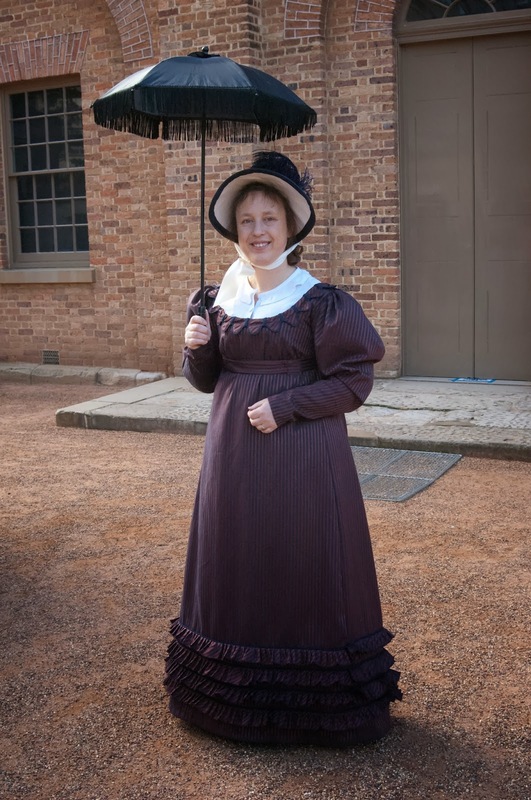 My 1820s walking dress was inspired by an 1820s gown in the Kyoto Costume Institute in Japan. My gown duplicated the neckline, cuff and hem ornamentation. It was made as a one-piece dress with a belt under the bust and hook & eye closures at the back. The existing gown is made of a brown and blue striped silk taffeta. 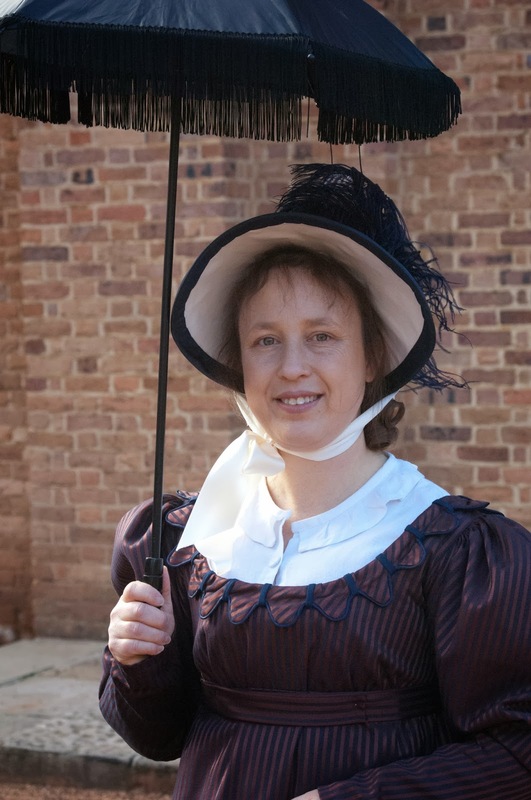 It has a separate jacket and dress, matching belt, silk taffeta cording and puff decoration on the bodice, and four rows of flounces on the bottom of the skirt. The original is not available for the public to see in person. Finding a close matching fabric was a challenge - after spending months searching unsuccessfully online for a similar striped silk I found some fabric in my stash previously reserved for a gentleman's frock coat. Although not the same colour, it immediately seemed right for this project. Much of the gown was sewn by hand - there is a lot of piping on the ruffles and around the neckline. My biggest challenge was working out how to sew the neckline and how to make it sit flat in real life. My solution - more is better. (Make the scallops larger, gather them in more with the loops - then they sit flat.) I still find my experiments in amongst my fabric scraps months later! Another challenge was the lack of any photos or documentation on how it was fastened at the back - or even if it was. I emailed and then posted a letter to the caretakers of the KCI collection in Japan but didn't receive any reply. See more at Aylwen's blog. I'd give my eye teeth for that striped silk -- well worth the search! The ruffle/scallop details on this are beautifully done and look wonderful. Thank you! I remember when I first bought the fabric that no one really like it - now I can't imagine making the dress without it. A great result considering the challenges you faced researching this dress! I love the fabric you made it in. Funny how sometimes, the best fabric we'll ever find for a project is already in our stash! I recognized that gown when I saw it! Great work! The gown is beautiful, that is such a great fabric! The cuffs are my favorite part, so wonderfully done! Thank you! The cuffs were difficult, but thanks to the thinking of fellow costumer Sabine Schierhoff in Germany I was able to work it out. This is just amazing! As soon as I saw the thumbnail image I knew it must be inspired by the KCI dress, the original is one of my favourites so I was really excited to see your version. You really did it justice and the fabric is perfect. I can't imagine how long all that fine piping took, but it really paid off because it is stunning! To have created such a lovely interpretation of the costume with limited information of the original is a great achievement and I hope you are really proud of the finished outfit. Thank you! Yes, there was indeed more work than I imagined in the skirt. Thankfully I did the skirt first and laid it out to do the trim, sewing the side seam together last. First I made the piping, then I made the ruffles, then I sewed them together before I then attached them to the skirt.